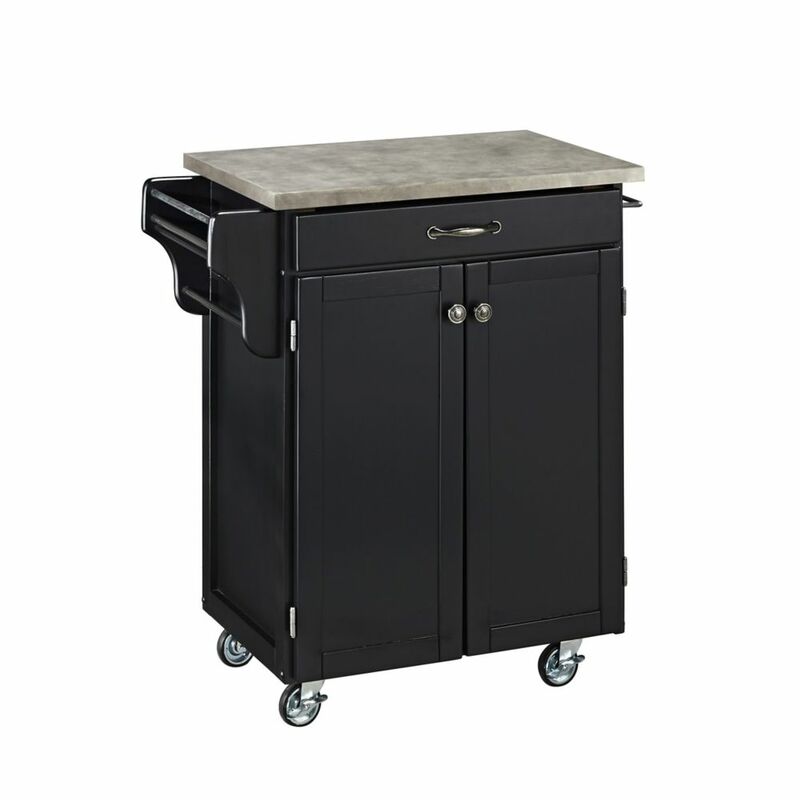 Home Styles Create-a-cart in a black finish with a wood top features solid wood construction, and 4-Utility drawers; 2 cabinet doors open to storage w/adjustable shelf inside; Handy spice rack with Towel bar; Paper Towel holder; Heavy duty locking rubber casters for easy mobility & safety. Size: 48w 17.75d 35.5h. The Country Comfort collection by Home Styles encompasses a traditional design while projecting a well-bred sophistication. The quality is manifested in the poplar solids and mahogany veneers. The kitchen island is perfected with an aged bourbon finish and cup pull antiqued brass hardware. Featuring a solid wood top, one cabinet with an adjustable shelf, one storage drawer with side-mounted metal guides, two open shelves (one adjustable), and breakfast bar. The patented sliding mechanism provides independent movement of the two legs for the extension of the breakfast bar. The breakfast bar extends the surface from 25 to 36.25. Please note finish and measurements may vary slightly. Assembly required. Size: 48x25x36 U.S. Patented.